A soap dish may not be the first thing you think of when redesigning your bathroom, but there’s nothing more annoying than a melting bar of soap on the side of the sink, or constantly losing a bar to the floor of your shower, which can only lead to a slippery floor. What's so good about soap dishes? Although many of us use liquid soap these days, bars of soap are coming back into favour as an eco-friendly, low-plastic alternative. Investing in a soap dish will not only act as a display for your soap, but actually save you some time on frequently wiping down the sides of the sink. A soap dish is also much more hygienic than just leaving your soap on the side, too. Airing holes will allow a wet bar of soap to drain and dry without coming into contact with the sink's surface, and many will usually have a handy bowl section for quick and easy disposal of excess water. If you’re short on space, look out for soap dishes that can be wall mounted, which are ideal for showers, too. Lastly, a soap dish can add a bit of style to your bathroom just like any other accessory. 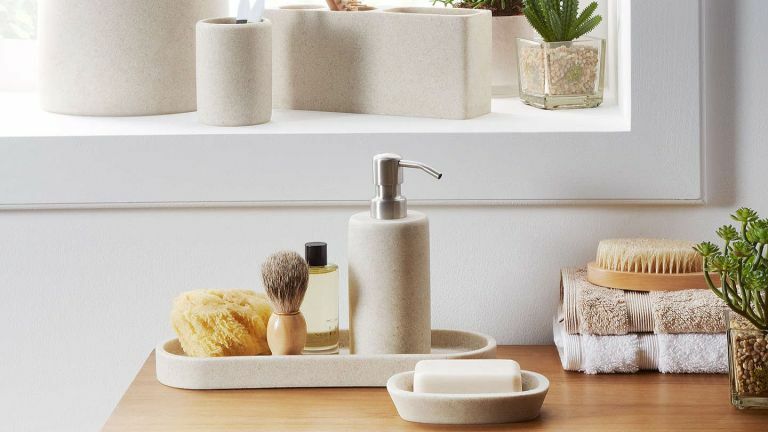 This all-natural wooden soap dish is a little different to the traditional china ones you’d expect to see in most bathrooms, and for that reason it is a popular choice in modern bathrooms. The wood is varnished with natural oils which protects it from water, so you can expect this soap dish to hold up well. It has drainage holes to dry out the soap, however it can be a little tricky to clean as the base does not come apart. Something for the eco-warriors. This soap dish boasts no frills but is designed to keep your soap to hand when in the shower. The soap dish screws into the wall so that your soap can be kept at the optimum height for showering and allows the excess water to drip through to the base of the shower, thus creating no mess. It boasts no frills but is practical and is a classic silver chrome colour that is likely to complement most bathroom features. If you’re all about minimalist style, then marble is a popular choice for accessories. This marble plate can provide a stylish pedestal for your luxury soap bar, and although it doesn’t have drainage holes, it will stop it from melting all over your bath. With matching items available, this could be a great way to bin mismatch accessories in your bathroom. For those who prefer to have baths over showers, this soap dish fits neatly at the end of your bath with a waterfall-style edge that allows your bar of soap to easily drain after use. It’s made from plastic, so it isn’t the fanciest on the market, but users found it to be incredibly practical for keeping their soap clean and dry. This sandstone coloured dish is popular among those who have neutral coloured bathrooms, and is said to be sizable enough for many types of soap bars. Users love that there are matching items available and the soft, rounded edges keep excess water contained to reduce mess around the sink. There are no drainage holes but this dish is easy to empty and clean as and when necessary. This shiny soap dish is ideal for placing inside the shower or at the side of the bath. It doesn’t require any installation as it uses a suction pad to stick to the wall. This design allows the soap to dry and for excess water to simply drip through the bottom, leaving no mess and a clean and dry bar of soap. Users like how simple this item is and that it matches most chrome bathroom features. The copper trend is now making its way to the bathroom and this soap dish is just part of Made’s industrial-style bathroom accessory collection. The modern dish made from iron features a mirror-effect top with one singular hole for draining your bar of soap. It has a dipped middle to allow the soap to air out and it’s easy to wipe clean with a cloth when needed. For a stand-out accessory, give this soap dish a try.